The Rasoi Tandoori Indian Kitchen - Mount Martha uses their own specialised couriers to deliver their food. Lightly spiced assorted fresh vegetables dipped in chickpea batter and shallow fried. Spiced slices of onion dipped in chickpea batter and shallow fried. Pastry pyramids stuffed with lightly spiced peas and potatoes. Lightly spiced mushrooms rolled in a chickpea batter and shallow fried. Tandoori marinated chicken fillets rolled in a light chickpea batter and shallow fried. Mild tandoori marinated fish fillets rolled in a light chickpea batterand shallow fried. Marinated tiger prawns rolled in a light chickpea batter and shallow fried. Traditionally marinated mushrooms roasted in our tandoor oven. Minced lamb with a hint of ginger, garlic, fresh coriander and freshly ground spices, skewered and cooked in our tandoor oven. Boneless chicken marinated in yoghurt, special herbs and light spices, cooked in our tandoor oven. Lamb cutlets marinated with special herbs and authentic spices. 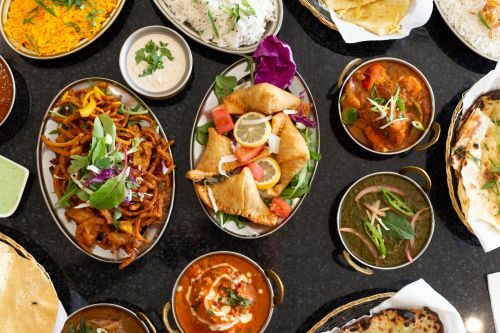 Our popular mouth watering platter has a selection of tandoori specialties. Tiger prawns cooked in our famous creamy tomato based sauce. Tiger prawns tossed with onions, capsicum and masala gravy, with a dash of coconut milk. Tiger prawns cooked in our homemade spicy vinegar based curry. Fillets of fish cooked in our famous spicy vinegar based curry. Fresh fillets of fish prepared with our own special spices, finished with a dash of coconut milk. Tiger prawns pan fried with garlic, chilli, lime and the chef’s special spices. Marinated tiger prawns, fish of the day, and various seafood - slow cooked in our tandoor oven and served on a sizzling hot plate. Our famous Butter Chicken contains boneless chicken with light spices and crushed cashew nuts in a pureed tomato sauce. Boneless chicken cooked with cashew paste and yellow gravy with a dash of light cream. Marinated chicken fillets, cooked in our tandoori oven then pan fried with diced onions, green capsicum and a mild red gravy. Tender chicken fillets cooked with punjabi style spinach and a hint of fenugreek and coriander. Marinated chicken fillets, pan fried with diced green capsicum, onion and tomatoes with a yellow gravy. Tender boneless chicken pan fried with capsicum, tomato and special spices in a light sweet and sour gravy. Marinated chicken fillets, cooked in the tandoor oven, then pan fried with chickpeas and a traditional masala gravy. South Indian dish made with curry leaves, coconut milk and mustard. Chicken fillets pan fried with onion, capsicum, green chilli and chefs special spices. Chicken fillets cooked with onions, garden vegetable's and chef’s special spices. Lamb slow cooked with yoghurt, onion, garlic, ginger and tomato. Tender lamb cooked in a yellow coconut gravy. Lamb cooked in a mild creamy sauce with dried fruits and nuts. Lamb pieces cooked with spinach, fenugreek and a hint of coriander. A dry dish, tender lamb well seasoned in authentic spices, cooked with onions, tomato, capsicum and coriander. Succulent lamb cooked with cashew paste and served in a mild yellow gravy with a dash of light cream. Tender lamb cooked with homemade vindaloo paste. Tender lamb cooked with onion, capsicum, green chilli and spices. Lamb cooked with onions, garden vegetable's and chef’s special spices. Beef marinated overnight in vindaloo paste and special tangy spices. Beef chunks cooked in coconut milk and authentic South Indian spices. Beef in a mild creamy sauce with fennel seeds, dried fruit and nuts. Traditional beef curry cooked with potatoes and onions. Beef cooked in mild yellow cashew gravy with a dash of light cream. Choice beef pieces cooked with spinach, fenugreek and coriander. Tender beef cooked with onion, capsicum, green chilli and spices. Beef cooked with onions, garden vegetable's and chef’s specialspices. Urad dal or black lentils cooked in traditional Punjabi spices. Diced pumpkin tempered with onion, fennel seeds, fenugreek and finished with chefs own sauce. Chunky potato and peas cooked in a mild curry sauce. Homemade cottage cheese served in a delicious tomato based light cream sauce, with authentic spices and crushed cashew nuts. Cauliflower and potatoes tossed in northern Indian spices, served with spring onions and coriander. Fresh spinach and potatoes cooked with traditional northern Indian spices. Fresh spinach and homemade cottage cheese, cooked with traditional punjabi spices. Fresh seasonal vegetables tossed with garlic, ginger, coriander and light spices. Eggplant and potato cooked in light spices. Fresh seasonal vegetables cooked with mild spices in cashew sauce and finished with a dash of cream. Chickpeas cooked with fresh tomato, cumin and traditional spices. Dumplings made from cottage cheese, nuts and minced fresh vegetables, cooked in a mild creamy gravy. Home made cottage cheese cooked with onion, capsicum,green chilli and chef’s special spices. Mushrooms cooked with onion, capsicum, green chilli and the chef’s special spices. Chicken tikka, mix salad, roti and mint sauce. Seekh kebab, mix salad, roti and mint sauce. Your choice of chicken/lamb/beef cooked in basmati rice. Organic whole meal flat bread cooked in the tandoor oven. Plain flour flatbread cooked in the tandoor oven. Roti or Naan finished with garlic spread. Naan stuffed with spiced potatoes and cottage cheese. Naan filled with dried fruit and nuts. Naan stuffed with lamb and authentic spices. Plain flour tandoori bread finished with garlic and masala spices. Naan stuffed with cheese, spinach and fresh coriander. Plain yoghurt mixed with cucumber, carrots and light seasoning. Famous Indian dessert; sweet dumplings in an authentic sauce.